I've been wanting to check out time of the month boxes for quite some time, especially My Cotton Bunny (because I think the name is perfect and I love their packaging)! When they offered to send me a box to review I was ecstatic. I think these types of subscriptions are perfect for someone when they first get their period to help them feel more comfortable with the change their body is undergoing. I know I would have loved a special treat for that time of the month at the onset. And I was very happy to receive this box, even at my age, to ease my turbulent feelings at that time of the month. I had no idea what to expect when I opened this box. I knew there would be the feminine hygiene product I requested, but besides that it was a complete surprise. They usually include a small gift and some treats along with tampons or pads, whichever your preference is. Here is what I saw when I opened the box. I couldn't see much with the first glance, but I did like how neatly it was packaged. I liked the view when I removed the tissue paper. There was a card enclosed detailing what was included in the box. 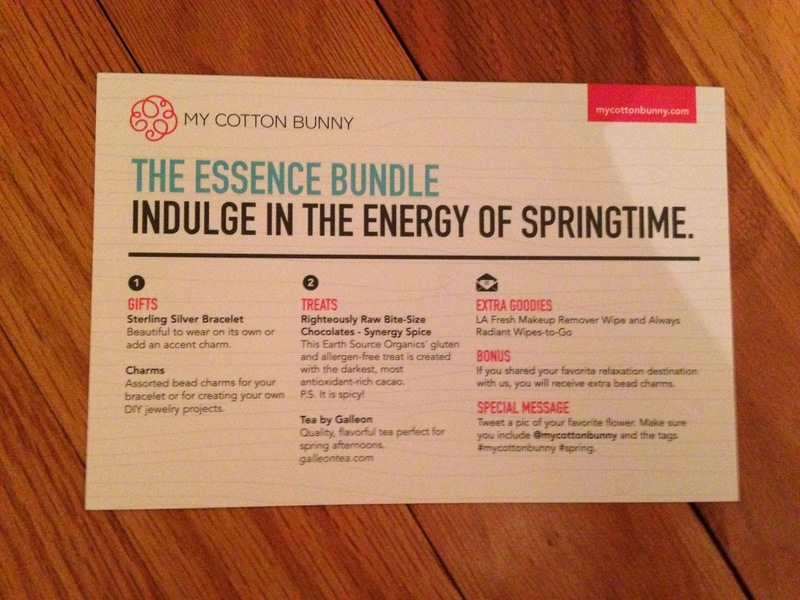 This month's theme was The Essence Bundle and included items to encourage you to indulge in the energy of springtime. The first item was the feminine hygiene product. I know what you're thinking, I'm probably the only person that uses pads instead of tampons. I just could never get comfortable with tampons and always felt like they'd get stuck inside me. I might be crazy, but I just can't use them. There are some time of the month subscriptions that do not offer pads as an option, so I was very happy to learn that My Cotton Bunny offered pads. And these happen to be my go to brand! Yay!!! Now onto the fun stuff. I saw a little bag enclosed and I had to look to see what that was first. 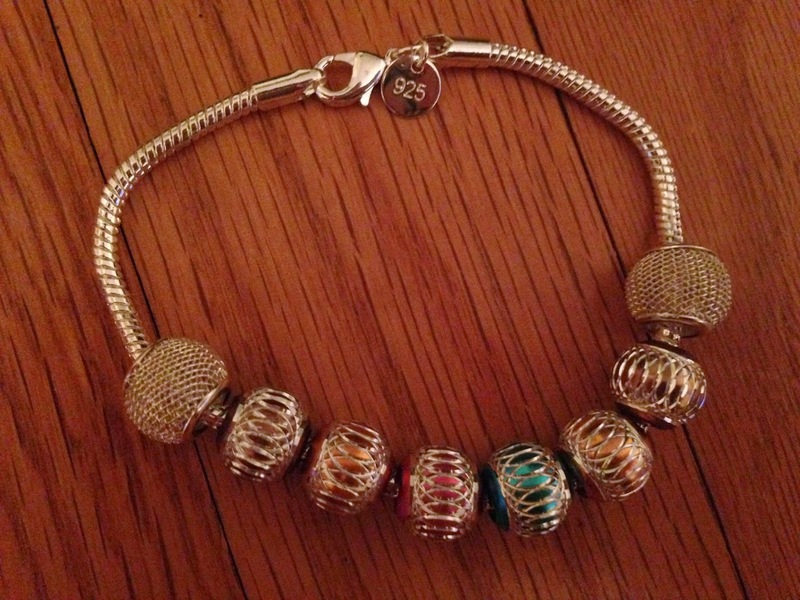 I was so excited to see it was a sterling silver bracelet and beads to decorate the bracelet. I love this! You can wear the bracelet with or without the beads! 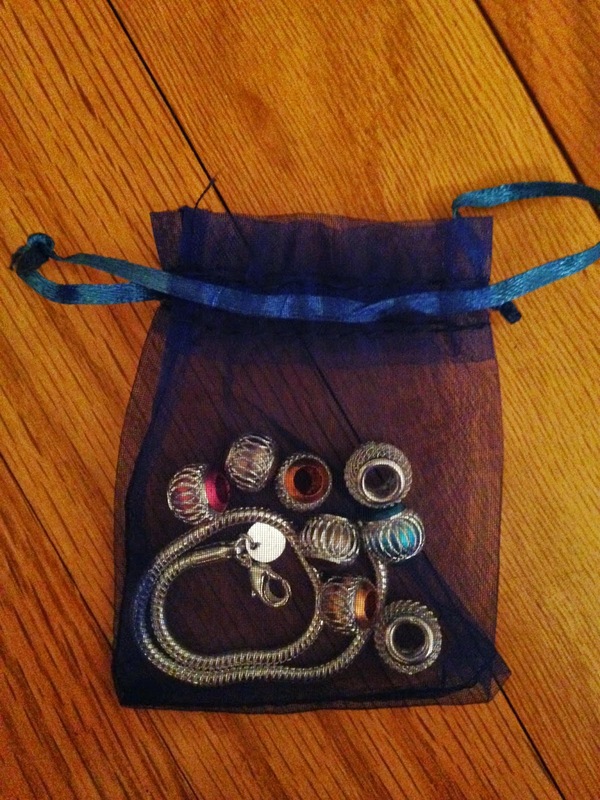 As a bonus My Cotton Bunny included extra bead charms if you shared your favorite relaxation destination with them! I think the quality of this bracelet is great and can't wait to wear it!!! Also, included was some treats. 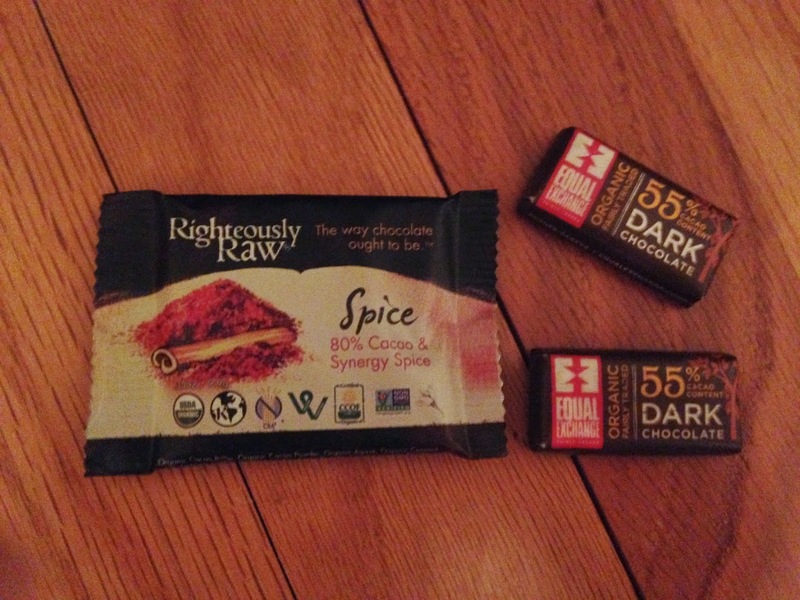 I love chocolate, so I can't wait to try the Righteously Raw Bite Size Chocolate in Synergy Spice! It sounds delicious. And you can never go wrong with dark chocolate. 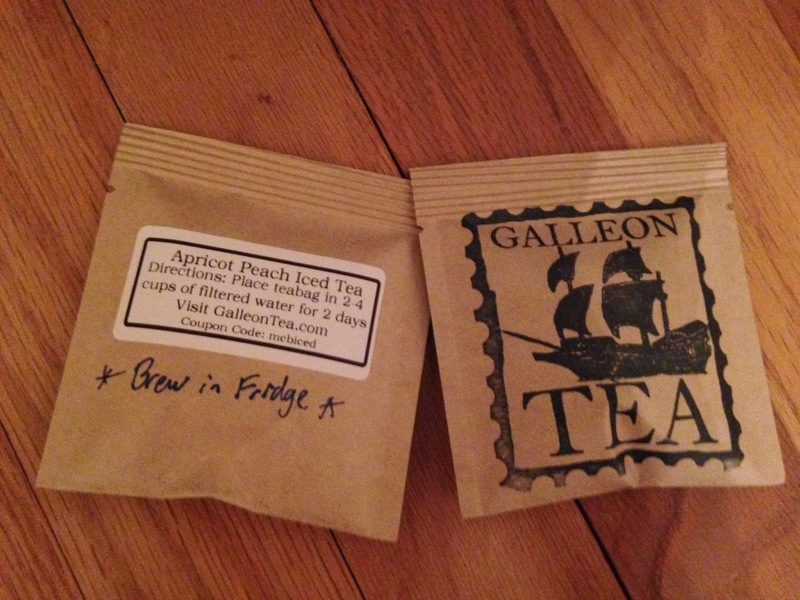 Another treat included was Galleon Iced Tea. These teas are meant to be brewed in the fridge and I can't wait to try them! I received Mango Passion and Apricot Peach. They both sound delicious and perfect for a hot summer day! As an added bonus a LA Fresh Makeup Remover Wipe and Always Radiant Wipes-to-Go was included. 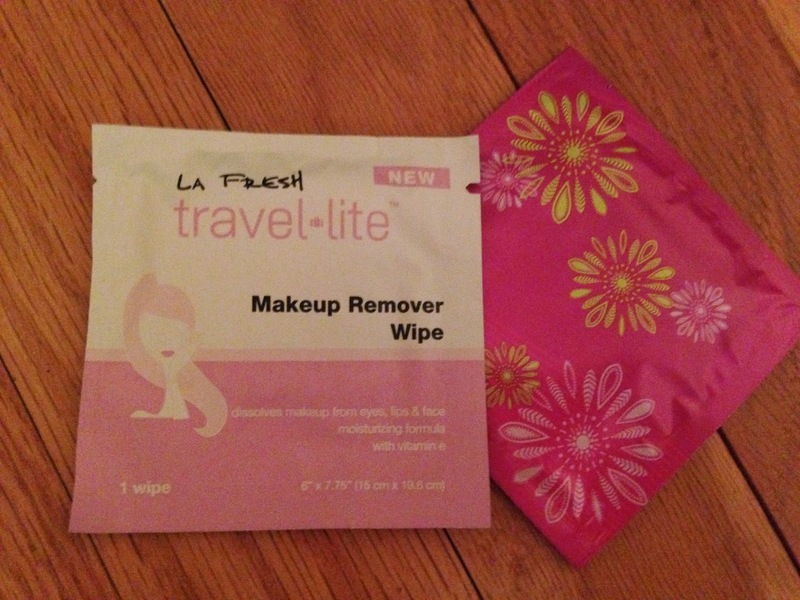 I've tried the LA Fresh Makeup Remover Wipes before and like them. These always come in handy when you don't feel like washing your face after a long day. 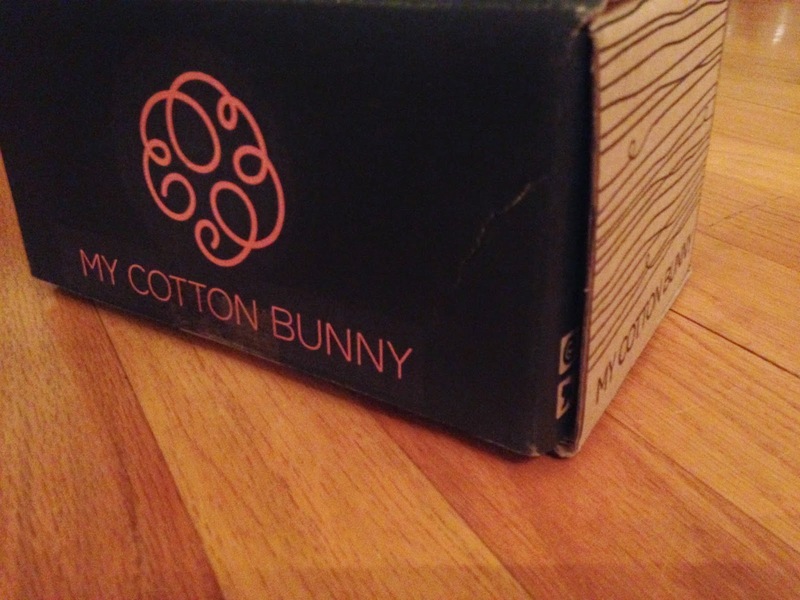 I loved everything included in this month's My Cotton Bunny box, especially the bracelet! 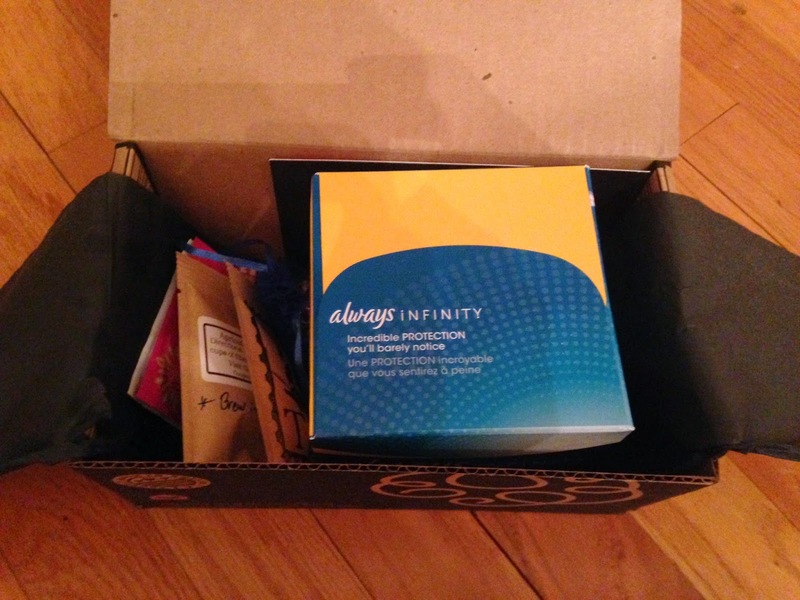 This box would definitely make me feel better about it being that time of the month. Who wouldn't want a special present for themselves at that time?!? 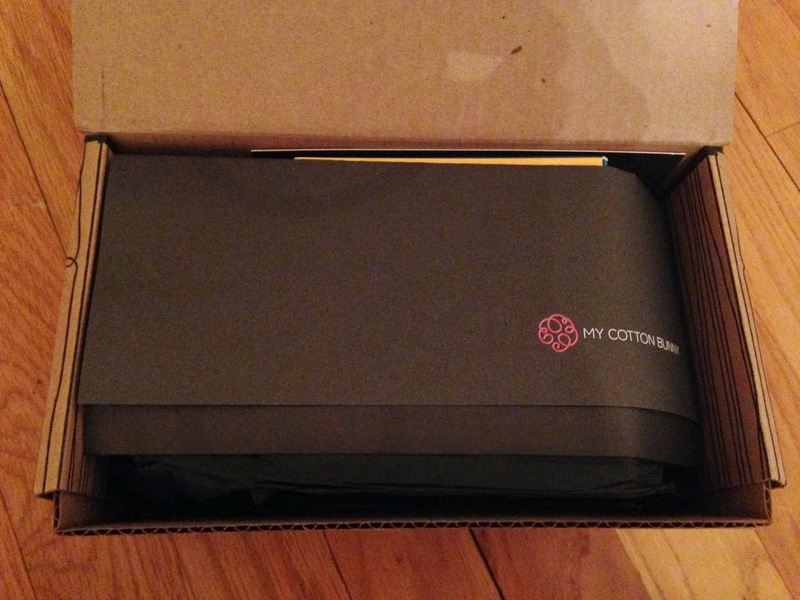 If you loved this box as much as I did and want to subscribe, sign up with the code MAYBLOGMCB to save 10%. 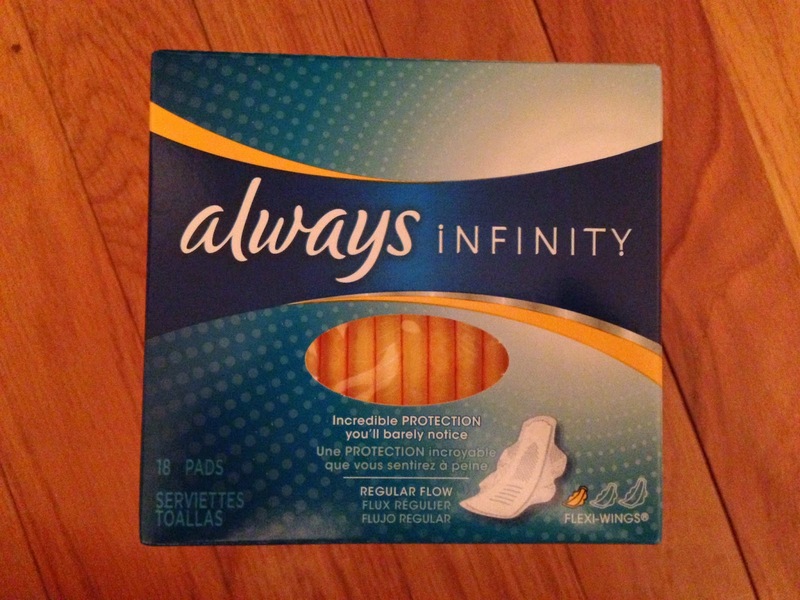 Don't worry - you're definitely not alone in preferring pads over tampons. My reasoning is a little different, but I still prefer pads 95% of the time. LA Fresh! I once got a packet of Waterproof Makeup Remover in my Eco Emi box and I loved it. LA Fresh really makes good wipes! Nope, you're not the only person who uses pads instead of tampons! I'm not comfortable with tampons either, I won't go into detail because you probably don't need strangers talking about their periods on your blog, but just know you aren't alone lol. The bracelet is really pretty, too!